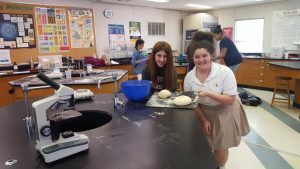 In Life Science class with Ms. Londono, 7th graders learned that yeast are unicellular organisms from the Kingdom Fungi. Yeast carry out cellular respiration by taking in oxygen gas and breaking down sucrose; as a byproduct of this reaction carbon dioxide gas is produced and makes bread rise. 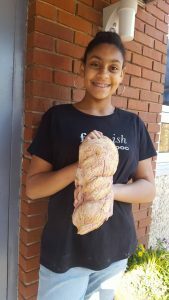 The first step in making bread in our class was determining that the yeast was alive and producing carbon dioxide bubbles. This was followed by mixing and kneading and finally by baking. Every girl took a loaf of bread home (though some of the bread may have not have made it home :).